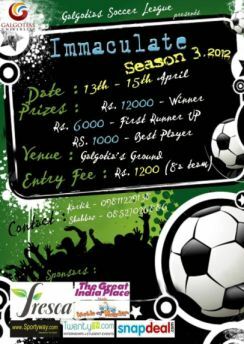 Fest Info: Galgotias Soccer League presents IMMACULATE Season 3, 2012 on 13th -15th of April 2012. Futsal is a variant of association football that is played on a smaller pitch and mainly played indoors.Futsal is played between two teams each with five players, one of whom is the goalkeeper. Unlimited substitutions are permitted. Unlike some other forms of indoor football, the game is played on a hard court surface delimited by lines; walls or boards are not used.